When temperatures soar in the SA summer, so do the sales of air-conditioning units - and household electricity bills. The reason is that air-conditioning units (ACs) can use almost as much power to keep you cool as a heater does to keep you warm in winter. For example, a single 1500W window or room AC running six hours a day will cost you at least R500 a month to run at current SA electricity tariffs. In addition, all those ACs going full blast in our homes, shops and offices are putting strain on SA's already overtaxed power grid - and adding to the air pollution emitted by our coal-fired power stations. So budget-conscious and environmentally aware homeowners are increasingly returning to an old favourite, the ceiling fan, whichproduces a natural "wind chill" effect that immediately makes one feel cooler, whatever the temperature may be, and will typically cost about R40 to R50 a month to run. To get the full cooling benefits, however, you have to install the right size fan in the right position. Sizes generally run from about 1m to 2m across and optimal air circulation occurs in square areas. A 1,5m fan will suit a 3m x 3m room, for example, but if you're cooling a large, rectangular room, you should use two or more fans, evenly spaced. * You also need to consider ceiling height. Most manufacturers recommend a 3m fan-to-floor distance if possible and for safety reasons, a ceiling fan should never be mounted less than 2m from the floor. * Since the average ceiling fan weighs in at 8kg or more, it will also need to be securely anchored to a sturdy roof truss or beam and should be professionally installed. And an electrician will need to certify its safety as part of your home's electrical system, or it could void your home owner's insurance cover. * Another factor to consider is the number of fan blades and the materials they are made from. To work properly, ceiling fans should ideally have three to six blades, but balance is more important than the number, as uneven blades will cause the fan to wobble. 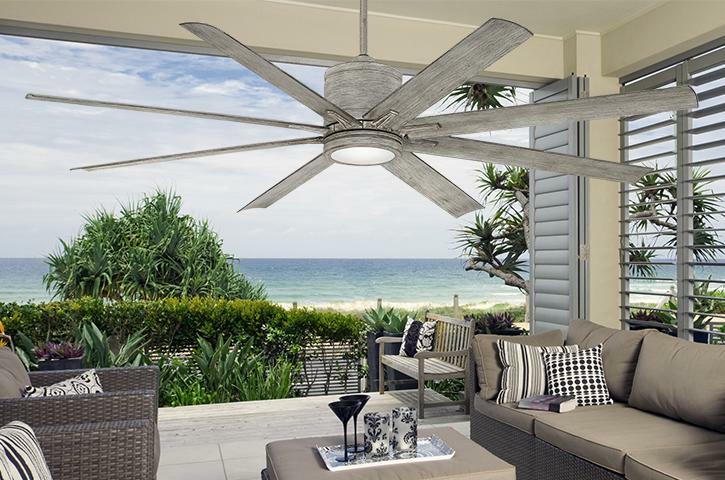 It is thus important to select fans with rust-free finishes and blades that won't warp - especially in damp coastal climates. * And finally, if you're replacing an overhead light with a fan/ light combination, you need to decide what controls to look for. Options include pull chains, wall-mounted control boxes and, with many newer models, handheld remotes.